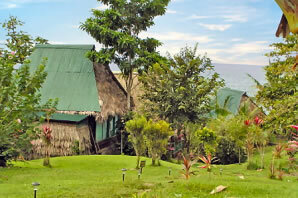 Located 2 miles south of Drake Bay, inside the Punta Rio Claro National Wildlife Refuge, you will find Punta Marenco Lodge. 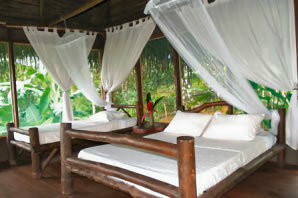 Each of the private bungalows have ocean views and are built in harmony with the surrounding rain forest. There are private trails, and beach trails with miles of pristine beaches to explore, and many activities such as tours to Corcovado and Caño Island, Bird watching, Whale watching, snorkeling, swimming, and horseback riding that can be enjoyed from this privileged location. During your visit you will have a chance to see White Faced, Spider, and Howler Monkeys playing around your cabin, noisy Scarlet Macaws, and during season, from June through April, Humpback Whales as they migrate to Drake Bay. All accommodations offer private terraces and bathrooms, with breathtaking views of the ocean. 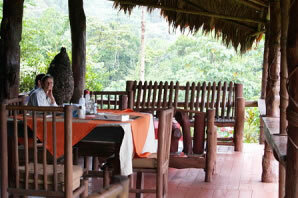 Family style meals are served in the open air restaurant where you can enjoy the spectacular sunsets. 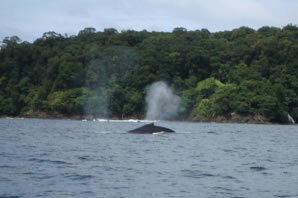 In the whale migrating seasons, December through March for the Humpback whales from the north (Mexico, California) and July though October from the south (Peru), you can observe these majestic creatures on a whale and dolphin tour or just as easily from the restaurant or the comfort of your bungalow. Punta Rio Claro Wildlife Refuge is surrounded by a primary tropical rain forest and there are private trails for the exclusive use of Punta Marenco guests to explore alone or accompanied by one of the naturalist guides.